No, no and no! Don't be stupid! Eat to satiety and fast or stay fat forever! 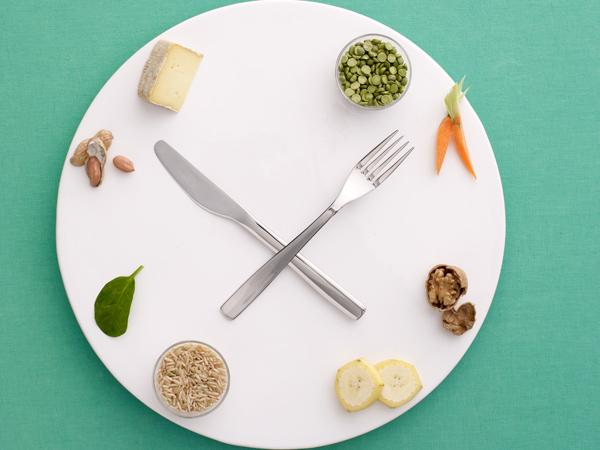 Frequent meals will hamper not improve dietary T2DM treatment. If you want my honest opinion, the only thing that's surprising about the following line you are about to read in all major science news outlets, today, is that it has taken scientists years to understand that "two large meals (breakfast and lunch) better than 6 small meals with same calories for controlling weight and blood sugar in people with type 2 diabetes." This is a quote from the press release that was published along with a recent paper in the scientific journal Diabetologia (the journal of the European Association for the Study of Diabetes) which "suggests that two large meals (breakfast and lunch), rather than six small meals with the same total calories, are better for controlling weight and blood sugar in people with type 2 diabetes." The corresponding experiment was conducted by Dr Hana Kahleová from the Diabetes Centre at the Institute for Clinical and Experimental Medicine in Prague. The study assessed 54 patients (29 men, 25 women) treated with oral diabetes drugs, aged 30–70 years, BMI 27–50 kg/m2 and HbA1c of 6–11.8% (42–105 mmol/mol). They were asked to follow one of two regimens of a restricted calorie diet, each containing 500 calories less than the recommended daily amount; in one programme the meals were six small meals (A6) and the other 2 large meals, breakfast and lunch (B2). The study was designed as a "cross over", this means all 54 participants were tested on the two and the six meal plans for 12 weeks each. Needless to say that the diet in both regimens had the same macronutrient and calorie content - otherwise, a comparison of the measured liver fat content, insulin sensitivity and pancreatic beta cell function (the cells that produce insulin) would obviously have been useless. Figure 1: Changes in anthropometric and laboratory variables. 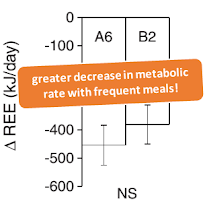 Data are shown as changes from baseline in response to the regimen of six (A6) and two meals (B2) a day (Kahleova. 2014). Apropos comparison, even a rocket scientist could easily tell that the data in Figure 1 speaks in favor of the two-, not the still heavily propagated "eat frequent small meals"-six-meal strategy. If you train in the PM skip breakfast and consume launch and dinner, only! The "breakfast is the most important meal of the day"-myth is about as flawed as the "eat frequently to get / stay lean" myth (learn more). Forget it and eat according to your schedule. If you train in the morning, or at noon, skip dinner. If you train in the afternoon, skip breakfast - or, put simply: Make sure to have a meal after every workout. In spite of the fact that the researchers found that the body weight decreased in both regimens, there was a highly significant advantage for the two-meal (B2; -3.7kg) regimen over the six-meal (A6; -2.3kg) regimen. Similarly, liver fat content (B2 -0.04% vs. A6 -0.03%), fasting plasma glucose and the pro-insulinogenic C-peptide levels decreased in both regimens - yet obviously more for the two-meal strategy. No, that's not a typo. In total contrast to what common stupidity... ah, I mean wisdom still says, eating more frequently will not decrease your hunger, and avoid the metabolic shut-down you'll experience on every energy restricted diet, sooner or later - on the contrary! 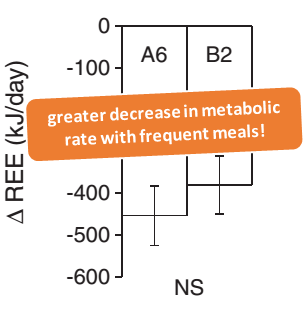 Figure 2: The difference may not reach statistical significance, but it should be pronounced enough to lie all myths about the "metabolically activating effects of frequent meals" at rest - wtf, look at the data: Never eating to satiety is the starvation signal - and not fasting for a couple of hours per day (Kahleova. 2014). Similar effects with less detrimental health effects have been reported for healthy individuals as well. So that I would suggest to extend the authors' conclusion that "[t]hese results suggest that, for type 2 diabetic patients on a calorie-restricted diet, eating larger breakfasts and lunches may be more beneficial than six smaller meals during the day," (from the press release) from the average lifestyle diabetic to everyone w/ a couple of extra pounds who is trying to shed weight... The very lean athlete, on the other hand, has so little body fat to draw on and may in fact be better off with more frequent meals. Bottom Line: This is not the first study that's questioning the general suggestion to eat more frequently to ward off and battle diabesity and I can guarantee it's neither going to be the last one. Needless to say, snacking is a no-go as well, right? Read for yourself! What I can guarantee, as well, though, is that it's not going to change the textbook- instead of evidence-based approach most doctors and dietitians are following. For these findings to finally make it into the day-to-day business of those people who are "dealing" with, but obviously not healing type II diabetics, it will take at least one generation of doctors and dietitians and two generations of their patients who may be paying for the delays with their lives. Lives that could have been saved if doctors and dietitians gave better advise and the patients had the guts to follow it. Addendum: In view of warranted questions about contradictions to previous articles, I would like to point out that we are talking about a weight loss scenario with restricted energy intake, here. Not! An ad libitum diet, where eating "as often as you like", even if that may be eight times per day will help those of you who have not already ruined their "hunger gauge" (I am talking about "HUNGER" as in "NOT APPETITE") to stay lean / make lean gains. For someone whose primary goal is weight loss, I have always pointed to "intermittent fasting" (=low meal frequency) as a very feasible way to cut calories and lose weight - it does not work for everyone, though.